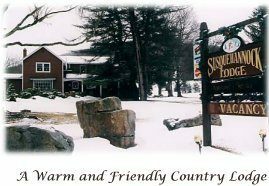 We offer clean and comfortable accommodations, home-cooked country meals served family style, and an informal and friendly family atmosphere to make your stay the first of many to come. We can help you discover the quiet, scenic secrets of our area and enjoy its history, its people and its festivals - a vacation you will cherish without having to spend a fortune. Enjoy hiking, biking, cross-country skiing or relaxing on the deck. Close to area attractions. Route 6 between Coudersport and Galeton between mile markers 189 and 190.